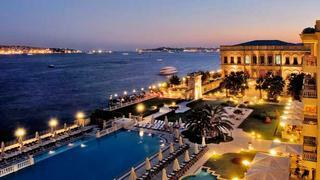 The 2013 World Superyacht Awards (WSA) – the most-anticipated evening in yachting – unfolded last night on the beautiful grounds of the Çırağan Palace Kempinski. The stunning venue overlooks the Bosphorus waterway in Istanbul, and here the elite of the superyacht industry gathered for the unveiling of the eighth annual WSA winners. The gala evening is attended by superyacht owners, their guests and families and top superyacht industry members. Former BBC presenter Natasha Kaplinsky presided over the prize giving of the coveted silver Neptune awards, which recognised the finest sail and motor yachts delivered in 2012. In addition, Judges' Commendation prizes were provided by Baccarat with the Alizée Sail trophy designed by Claus Harttung. Twenty-one awards and judges' commendations were awarded in total. Custom built for an experienced, second-time client of Alloy Yachts, 47m Loretta Anne was designed by Dubois Naval Architects who created an attractively low and sleek yacht. In practical fashion, her raised pilothouse is fitted with vertical windows to ensure optimum external visibility, while three sides of the flying bridge can be sheltered by powered, vertically-sliding glass screens. Outdoor and communal spaces have been maximized, while her modern interior, by Donald Starkey Designs, offers elegance, comfort and sophistication. A particularly low draft of 2.2m allows access to the shallow waters of The Bahamas and Belize. The 37.33m Pumula is the epitome of a modern classic sailing yacht. Built to the highest standards by Royal Huisman, her exterior lines reflect the beauty of a bygone age. Dykstra Naval Architects is responsible for her naval architecture and exterior styling. A sea-kindly hull with optimum underwater lines and an easily handled rig with carbon-fibre mast, PBO headstay and Kevlar backstay and in-boom furling guarantee modern standards of performance and handling. In this respect, her polar diagram forecasts 14 knots of boat speed on a broad reach. The interior by Rhoades Young is designed to match her exterior appearance and is executed in light oak, subtly aged to meet the expectations of a classic yacht. All six finalists in this category were admired for their high quality of build and layouts, designs and decoration driven by owner requirements. Close examination of each yacht provided no conclusive winner, so the judges concentrated on the detail. Mogambo, the 73.51 Nobiskrug built for a ‘commissioning owner’ with a long string of yachts to her name, stood out for her highly practical design detail, as well as for her appearance, decoration and layout. Naval architecture came from Nobiskrug while Reymond Langton Design provided both exterior and interior styling. At 77m in length, Smeralda is some 3.7m longer than her predecessors from Hanseatic Marine, an increase that allowed her owner to incorporate highly desirable features, including enlarged outdoor living spaces, a fully air-conditioned winter garden with slide-away glazing, and an enlarged and redesigned beach club with spa features, while retaining the attractive looks and 27-knot top speed of her sisterships. Espen Øino International, who was responsible for the exterior styling, collaborated with Hanseatic Marine Engineering on the naval architecture, while Vain Interiors did the interior design. he would use his yacht. The naval architecture was in-house by Heesen, who also collaborated with Omega Architects on the exterior styling; the interior design was by Bannenberg & Rowell. Built by McConaghy Boats, 42.5m Adastra received a special Judges' Commendation for most-innovative design in the category of Displacement motor yacht - below 500GT. Naval architecture is by John Shuttleworth Designs and exterior styling by John Shuttleworth and Orion Shuttleworth; interior design is courtesy of Jepsen Design. Judges examined all aspects before picking 33.9M Only Now, from Tansu Yachts, which was responsible for not only her build but her interior design and exterior styling. Naval architecture is by Diana Yacht Design. She blends an attractively modern exterior with an equally contemporary interior, while her West System wood-composite hull, together with a top speed of 22 knots and a 900nm range at cruising speed, combined with quality construction, well-decorated interior and excellent deck spaces made her a worthy winner. The 34.1m Koji by Leopard Yachts was recognised with a special Judges' Commendation in the category of Two-deck semi-displacement for her impressive performance and design. Her naval architecture is by Leopard Yachts and Carlevaris & Partners with exterior styling by Baccigalupo and interior design by Luxury Projects. Motor Yacht of the Year winner Loretta Anne won her class as a clear favourite. This 47m vessel is a development of two earlier motor yachts built by Alloy Yachts to designs from Dubois Naval Architects, and the judges considered that her additional six metres in length gave enormous benefits. They were not only impressed by the elegance of her exterior styling, but also by the interior design and interior layout, as well as the arrangement and facilities of the beach club and side-loading tender garage. Despite being the first foray into the arena of semi-custom superyachts for the UK-based Princess Yachts International, the judges felt that this first yacht of a series had been designed and built to impressively high standards. They also admired her attractive exterior lines and her exterior and interior spaces, which were also well decorated and laid out to ensure an optimum division between the size of guest and crew areas. Princess collaborated with Bernard Olesinski on the exterior stylist; Olesinski also provided naval architecture, while Bannenberg & Rowell Design and Princess gave the first 40m Princess her interior design. Yachts built to highly acceptable, but slightly less extreme standards, often do not get recognition despite the fact that they may offer a very comparable level of owner amenity and operational facilities. This year, judges addressed this issue with an award for Quality and Value, and recognised 72.6m Vicky, built by Proteksan-Turquoise Yachts with exterior and interior styling by H2 Yacht Design, as a yacht that exemplifies these factors. She is an eminently worthy winner of the first of these awards. Constructed for an experienced yachtsman, 39.95m J-Class yacht Rainbow was built by Holland Jachtbouw to the lines plan of the yacht of the same name that beat Endeavour in the 1934 America’s Cup, a shallow yacht with low internal volume. This tested the designers – Dykstra Naval Architects on exterior styling, naval architecture and interior design, the latter along with deVosdeVries Design – to the limit, but they created a beautiful yacht with an efficient deck layout and good accommodation for the owner, guests and crew. Extremely well built, she is a worthy winner. Quality of build, classic visual beauty and a highly detailed interior drew the judges’ eyes to 37.33m Pumula, designed by Dykstra Naval Architects and built to perfection by Royal Huisman Shipyard. The winner of her class also took top honours of Sailing Yacht of the Year. Interior designer Rhoades Young Design created a very efficient layout and matched this with a highly suitable classically-styled, light-oak interior, expertly aged to give the impression of having been well used over the years. Hamilton, the first yacht to be built to the Wally Cento class rule, impressed the judges for the attention paid to all aspects that would assure high performance, while also offering a comfortable, relaxing interior ambiance for cruising. The judges agreed that for builder Green Marine this was a highly demanding project based on the need to build a structure capable of managing enormous loads while keeping within a strict weight limit. The 30.38m yacht featured naval architecture by Judel/Vrolijk under Wally Cento design box rule with interior design by Design Unlimited, who collaborated with Monk Design on the exterior design as well. The sailing yacht in 30m to 39m class had to be combined with the monohull class because of the withdrawal of one of the nominated yachts. Again, the judges found comparison difficult, but recognised the 30.49m catamaran Quintessential built by Yachting Developments for its high quality of construction, its attractive exterior and interior decoration, and its layout, which enabled the creation of cabins and social areas readily comparable to those aboard monohull vessels of this size and larger. Naval architecture and exterior styling was by Warwick Yacht Design, and Redman Whiteley Dixon did the interior design. The 32.98m Simba built by Proteksan-Turquoise Yachts, with naval architecture, exterior styling and interior design by Hoek Design Naval Architects, was recognised with a Judges' Commendation in the Sailing Yacht 30m to 39m size range category. The winner was not difficult to identify as rebuilds do not get much more thorough than the work undertaken by Pendennis Shipyard on the yacht launched by Feadship’s De Vries Shipyard in 1983 as Circus II. The decision was taken to gut her interior, taking it back to bare steel, then lengthen her by 4.5m, before installing a new interior and machinery. Today, bearing her new name of A2, she is effectively a new yacht. She owes her new naval architecture to Pendennis along with BMT Nigel Gee, exterior styling to Pendennis and Peter Marino Architect and interior design is by Peter Marino as well. Built in 1934 by Sir Thomas Sopwith as the first of two J-Class yachts bearing this name, 39.6m Endeavour, originally built by Camper & Nicholsons, sailed to Auckland for a major refit with Yachting Developments. She received a new deck, new rig, upgraded crew quarters, and had major improvements to her owner’s accommodation. The task was approached with such detail and thoroughness, and completed to such high standards, that the judges had no hesitation in declaring her the winner. Naval architecture on the refit was by Dykstra Naval Architects, exterior styling by John Barrett Associates and interior design by John Munford/Adam Lay Studio. Faith’s (ex-Cakewalk, ex-Fortunato) owner placed her into refit at Compositeworks in La Ciotat in France. The extensive scope of works carried out to a high standard on the 62.3m Feadship included moving the pool from the aft sundeck to the forward sundeck, removing the secondary deck level on the aft sundeck, modifying the generator support frame to reduce noise in the owner‘s cabin, and conducting all the systems works on the interior that were to accompany the massive refit works by Die Oldenburger. Azure Naval Architects took on the naval architecture on the refit, Steve Howard consulting was responsible for the exterior styling and Chahan Interiors did the interior design. Marama was built as an expedition yacht by Kevin and Teresa Jaffé, and she has explored the world in this role since her launch in 2008. Last year, the 37.6m luxury yacht cruised from Seattle, Washington, to Glacier Bay, Alaska, in a three-month, 3,200nm voyage. The thoroughness with which the coastline was explored, the experiences enjoyed and the manner in which the cruise was documented with enchanting (and technically demanding) photographs and video, captured the hearts of the judges. Some 15 years ago, my studio phone rang and my PA turned to me: ‘I have a gentleman on the phone who is interested in doing a project with you – do you want to take the call?’ When the mystery owner arrived driving a McLaren F1, we decided to classify the enquiry as ‘serious’! What followed was a unique and enlightening owner-designer partnership between Tom Perkins and ourselves, which endured for years and many projects. Initial discussions were followed by meetings on board Andromeda La Dea, his Perini Navi sailing yacht. Andromeda doubled as the tender and support vessel for Mariette – a 1915 Herreshoff schooner Perkins raced very seriously, and he wanted to buy a dedicated support vessel that would allow him to continue with his world cruising aboard Andromeda, which encompassed both Antarctic and Arctic circles. To fill the role of support vessel, we found Atlantide, a lovely 122-foot (37 metre) ‘Dunkirk little ship’ built in the 1930s, and a full restoration was carried out at Camper & Nicholsons in Gosport. To match the schooner’s style, she was transformed into a true Art Deco gem. At the launch, the entire yard was carpeted in red, and the bunting that dressed his fleet of three yachts said much about Perkins’ self-deprecating style. It went somewhat along the lines of ‘never has one man attempted ostentation in such outrageous scale’. Few would have guessed the scale and complexity of Perkins’ next project. This was to be the largest privately owned sailing yacht in the world and, for good measure, it would have a revolutionary rig to be developed not by the builder but by the owner. The 88m *Maltese Falcon *was conceived. Having managed risk all his life, this was a challenge he was set to meet head-on. The rest is history. The project met all the targets, broke with convention, proved that the concept was right, and gave the world a new sail management system. Irrespective of his amazing achievements before and after, Maltese Falcon remains Tom’s defining moment. He once confided that he would not go down in history for his corporate successes, but for having built Maltese Falcon.